Buy Green City Ground Ginger - 26g in the UK from our online shop or directly from our independent Scottish store. Ground ginger is made from dehydrated fresh ginger and has a spicy, zesty bite. Soya contains isoflavones which can help with menopausal symptoms, like hot flushes and mood swings. The essential fatty acids in the seeds can help with stiffness in the joints as well as brittle nails and hair. Pumpkin seeds are high in zinc and sesame seeds are high in calcium - so as well as being delicious it is a very healthy cake, too! This recipe contains ½ tsp ground ginger. This chutney goes well with Indian foods, like curries, dahl or cheese. I made this chutney last year and it tastes great, even if I say so myself! What’s even better is that it’s a great way of using up any green tomatoes! This recipe contains ½ tsp ground ginger. A brilliant recipe from Bute Island Foods. Healthy, seasonal and suitable for vegetarians and vegans. Great for barbecues too! This recipe contains 1 teaspoon ground ginger. Make this homemade tomato ketchup with the last of your homegrown tomatoes. You can either use green, red or a combination of the two. This recipe contains 1 tsp ground ginger. Although this vegan pie takes 1.5 hours to make (plus 2 hours to set), it really is worth the effort. Velvety smooth pumpkin filling on top of a gluten free base made with pecan nuts and maple syrup. This recipe contains 2tsp ground ginger. Never knew what to do with seaweed? Try this healthy alternative to meat burgers, made with tofu and seaweed! Seasonal recipe with tomatoes and lettuce. This recipe contains ground ginger. This fried rice uses carrots and leeks, which are still available. And when you have grown them yourself, these will be the last before the new lot is ready! This recipe contains 1/2 tsp ground ginger. Make this warming gluten free porridge with dairy free almond milk. Cinnamon is great to start the day with. Try not to use table sugar as it will make the blood sugar spike, use low GI substitutes. This recipe contains 1/4 tsp ground ginger. Where can you buy real Ginger Ground - 26g safely online? If you are wondering where you can buy Green City Ground Ginger - 26g safely online in the UK, then shop with us. 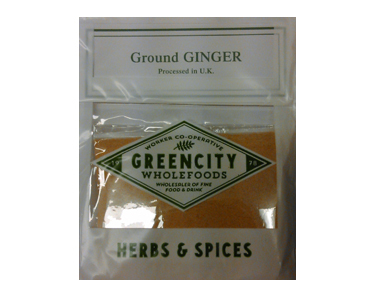 Ginger Ground - 26g - Green City Ground Ginger - 26g in Herbs & Spices and Herbs, Spices & Salt.